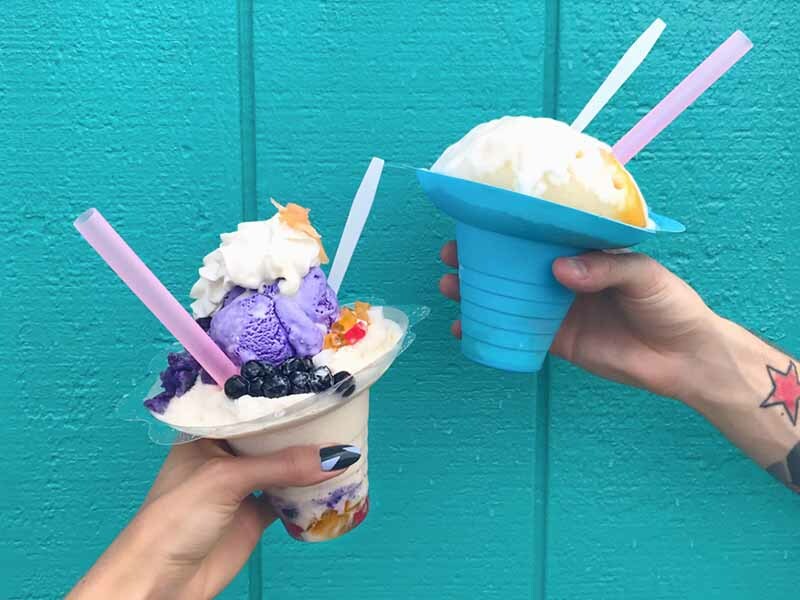 From Lau Lau to shaved ice. This is the essential list of Hawaiian dishes you need to try! Ultra-fresh shrimp (prawns to us Aussies) show up on menus across the Hawaiian Islands, but arguably the favourite crustacean-based dish is fried shrimp. The true quality of a plate of fried shrimp comes from the amount of buttery garlic sauce that comes with it; the more the better. Try it at: Fumi’s Kahuku Shrimp Truck on the North Shore of O‘ahu. Introduced by the Portuguese when they came to Hawai‘i in the 19th century, this doughnut without a hole is golden brown on the outside, fluffy on the inside, and coated with sugar. This salad is a traditional side dish, made from cured salted salmon chunks, fresh tomato and sweet Maui onions that are combined, or massaged (lomi lomi means massage in Hawaiian), to meld the flavours. Mix and match it however you like; the Hawaiian plate lunch is two scoops of white rice, macaroni salad and entrée – usually kalua pig, chicken lau lau (wrapped in taro leaves) or lomi lomi salmon. Can’t choose? Get a mixed plate and sample everything! This dish is considered to be soul food in Hawai‘i, so beloved it is. Meaning ‘leaf, leaf’ in Hawaiian, the name refers to the traditional process of wrapping meat (usually pork or salted fish) in taro leaves (luau) and then steaming it (wrapped in a ti leaf, which can withstand high cooking temperatures). It is now used to refer to the dish itself, which is usually served with a side of rice. The main attraction at any luau and a component of the plate lunch, kalua pig is cooked in an imu (underground oven) for several hours resulting in smoky, succulent meat. This frozen confection differs from a snow cone, which is made of crushed ice; shave ice soaks up the syrup better creating a fluffier texture. It was brought to the Hawaiian Islands by Japanese sugar plantation workers in the mid 19th century, and it is a huge hit all over the state.